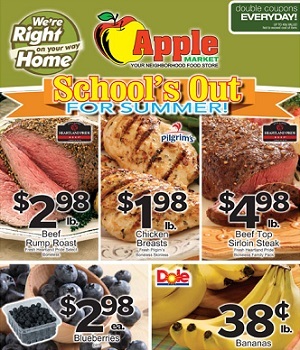 The latest Apple Market weekly ad circulars, sales flyer, coupons and specials. Every Apple Market store ad features great offers and promotions on grocery products. Find the latest ad specials: Fresh Heartland Pride Beef Rump Roast; Pilgrim’s Fresh Pilgrim’s Chicken Breasts; Fresh Heartland Pride Beef Top Sirloin Steak; Knorr Rice or Pasta Sides; Blue Bunny Big Fudge Bars; Kemps Ice Cream or Frozen Yogurt; Best Choice Canned Tomatoes; Best Choice Concord Grape Jelly; Best Choice Marshmallows; Pringles Potato Crisps; Nabisco Chips Ahoy! Cookies; Hunt’s Super Snack Pack Pudding; Arm & Hammer Laundry Detergent; Cascade Dishwasher Detergent; Nestle Coffee-mate Coffee Creamer; Planters Deluxe Mixed Nuts or Whole Cashews; I Can’t Believe It’s Not Butter; Weight Watchers Smart Ones Dinners; Belfonte Premium Ice Cream; Washington Premium Gala Apples; Seedless Watermelon; Green Giant Baby Cut Carrots; Hot House Cucumbers; Tomatoes on the Vine; Dole Salad Blends; Yellow or White Peaches; Kretschmar Hand Crafted Colby Jack Cheese; Suave Invisible Solid Anitperspirant Deodorant; Suave Invisible Solid Anitperspirant Deodorant; Old Spice Shampoo or Conditioner; Grill Ready Beef Kabobs; State Fair Corn Dogs; Farmland Smoked Sausage or Polska Kielbasa; AquaStar Raw Quick-Peel Shell-On Shrimp; and more. Apple Market stores activate their latest weekly ads every Wednesday. Apple Market has 33 stores located in Kansas, Missouri, and Nebraska. The grocery stores offer weekly hot deals and promotions, and a convenient shopping experience that includes everything from meat, produce, breads, dairy, pasta and more.